Upon arriving at the parking lot a half hour before sunrise, the bridge in front of the lake was already full of photographers lined up to take identical compositions of the scene as thousands before and after them will. This gave me a good chuckle as I packed up our gear in the predawn light. We were trying something different so time was of the essence. We started with the north trail and began to scout out photo possibilities. The goal was to move closer to the west side of the lake to get closer to the aspen groves that dot the shoreline there. The first light began to hit Mount Morrison as we were still hiking, so I made my way to the lakeshore to see what I could get. The resulting image, with Morrison reflecting off the lake next to some fall color in the foreground, was my favorite of the weekend. The views were so serene that even Callie was captivated for a moment. With the initial sunrise photos out of the way, we returned back to the parking lot to shoot the lake head on and then explore the southern trail that circles the lake. Back at the parking lot, I scooted into the still full line of tripods on the bridge, and took some photos of the “classic” scene, albeit with fairly harsh light. Callie was forced to wait in the car since her playful attitude does not mix well with stranger’s tripods. Soon enough, we were walking down the southern trail, surrounded by yellow aspens and cottonwoods. While the photographers all convened on the east side of the lake, we had the tranquil forest all to ourselves. Making our way along the south side of the lake, the views were constantly changing but never disappointing. 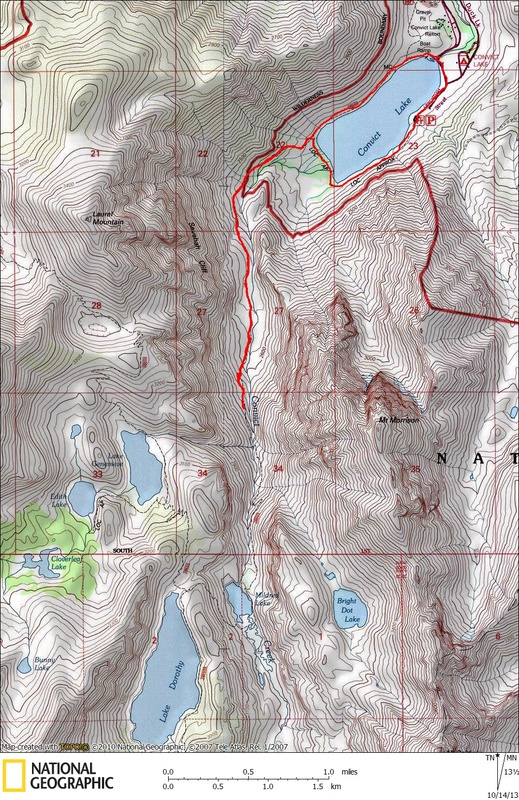 From the south side, there is a trail that heads up the Convict Creek canyon towards Mildred Lake and Lake Dorothy. We headed up the trail to see what fall color we could find. As the trail ascends close to Mount Laurel, the foreboding peak completely dominates the scene. Once you head past Laurel, the trail climbs up a canyon that is surrounded by ridges and flush with color. As is the norm, the color began to fade out in the upper regions of the canyon. We stopped short of reaching Mildred Lake once most of the color was behind us. Heading back down, the view from the trail towards Convict is much different from the opposite side. Owens Valley and the White Mountains make up the backdrop instead of the steep ridge of Laurel Mountain, creating a much more expansive view. Back at the lake shore, Callie got a much needed water break, and we returned back along the south side of the lake towards the car. The hike back on the beautiful, shaded trail was bittersweet as it signaled the end of our trip, but as fall signifies, all good things must come to an end, so that they can be renewed again. Any idea why how Convict Lake got its name?